Bauma takes place in Munich from 8th to 14th April 2019 and Trime will be in booth B0.108. Representing the UK with be Trime’s CEO, Ray Caulfield and Managing Director Paul Hay. The team from Italy will include; Managing Director Paulo Tacconi, General Manager Andrea Fontanella, alongside Matteo Tagliani and Matija Maticevic. The Trime export department is managed by Simone Dalu, who will also be present during the week of the show. On display will be their best-selling X-ECO LED. This set has been very popular with rental companies throughout Europe and is now available with 160w energy saving LED lamps. These newly introduced lamps can save energy usage of up to 25% when compared to standard LED lights. With sustainability at the heart of their developments, Trime will showcase three hybrid lighting towers that utilise a combination of solar, battery and engine power. 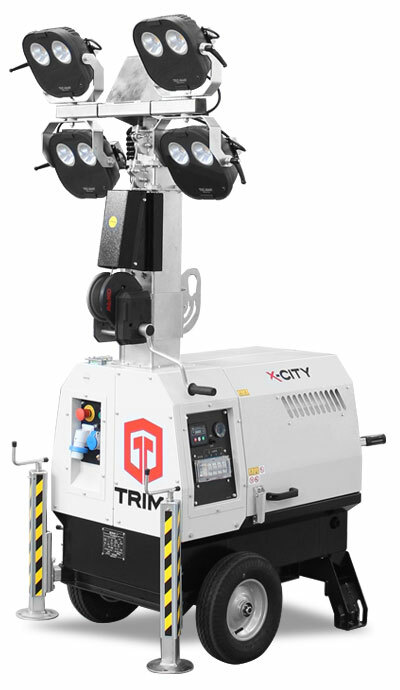 The Trime X-City Hybrid combines a single cylinder Yanmar diesel engine with a battery pack that powers four energy saving LED lamps. The 3500mm vertical mast is certified in wind speeds of up to 80km/h and twenty units can be loaded onto a single lorry. The compact size of the X-City hybrid means that a single set can be delivered via small truck with a height capacity of 1.8m. The unique feature of the X-CITY hybrid is electrically assisted motor; which means it can be effortlessly moved around a site with just a touch of a button. Trime believe that the X-CITY hybrid is the first lighting tower on the market to have this feature. Also on display will be two solar assisted lighting towers – the X-POLE solar and the latest addition to the Trime range - the XTS. The X-POLE solar set runs from a mix of solar and battery power. When in operation, X-POLE solar uses no fuel and consequently discharges zero emissions. Its 50w LED lamp will illuminate an area of up to 400 sq. metres and the complete unit is fitted into a strong galvanised base with handy fork lift pockets. The XTS has just arrived from the Trime’s design team. The XTS has impressive environmental attributes – it is total silent and emits zero carbon emissions. The XTS is fitted with the latest solar panel protected by a safety screen and features multi-directionally adjustable and movable individual floodlights. The Trime manufacturing plant is based in Cassinetta di Lugagnano, near Milan and the UK operation is situated in Huntingdon, Cambridgeshire. They are one of Europe’s leading organisations in the manufacturing and supply of site LED light sets, with a team that has a collective 50 years’ experience in the design and marketing of sustainable site lighting.